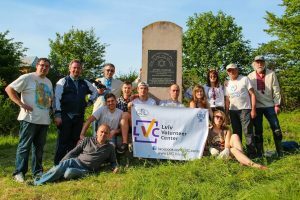 Yesterday we joined a dozen activists from the Lviv Volunteer Center, including our friends Sasha Nazar and Ukrainian independent filmmakers Dasha and Sashko Balabai, to clear vegetation at Rohatyn’s new Jewish cemetery. The work was part of the preparation for professional non-invasive ground surveys that will be conducted beginning next week by a team led by Dr. Caroline Sturdy Colls of Staffordshire University’s Centre of Archaeology. The LVC crew was joined in Rohatyn by American Peace Corps volunteer Casey Peel. Under a bright sun and dry weather conditions, the work lasted about eight hours using several power cutters and many hand tools. Each member of the crew was advised in advance of the archaeologists’ needs to enable their instrumentation to pass very close to the surface of the soil without significant obstruction. That included the removal of vegetation (except medium- and large-sized trees) to within 5cm of the soil surface, plus any significant foreign materials, but without disturbing the soil or penetrating into it. The date for clearing the cemetery was set for a week ahead of the survey start date, in order to minimize re-growth. A panorama of the cemetery at the start of the day. Photo © 2017 Jay Osborn. The chainsaw and string trimmer in capable hands. Photos © 2017 Jay Osborn. A chainsaw was skillfully used to cut some of the twisted trees and branches, and a string trimmer made hay of tall grass and light plants in the center of the cemetery. Much of the clearing effort required hand tools, to cut shrubs and tree shoots too small for the chainsaw and too large for the string trimmer; loppers, hand cutters, and light axes steadily mowed down large swaths of vegetation. Probably the largest effort of the day was simply removing the cut greenery from the cemetery, requiring many hands and countless trips down and up the cemetery to drag or carry the loads. Despite the good working conditions and the heroic effort of the volunteers, the vegetation at the cemetery was so thick that we were unable to clear the entire site in one day. We are working now to arrange a second clearing for next week to do the rest before the archaeologists arrive. We left a very large pile of cut trees, shrubs, other vegetation, and garbage collected at the site for removal, which the City of Rohatyn has agreed to do. Gathering and hauling, all day long. Photos © 2017 Dasha Balabai, Marla Raucher Osborn, and Jay Osborn. The newly-discovered headstone, and one of the thorny branches. Photos © 2017 Jay Osborn. Near the end of the day yesterday, the crew discovered another large surviving granite headstone, lying face down near the southeast corner of the cemetery. This section of the cemetery has been inaccessible for the past six years of our visits due to a dense thicket of large and woody thorn shrubs. The spikes on these tall shrubs are so fierce that no one had braved them in past clearings, but yesterday’s crew proved tough and spirited. On our next visit, we will do further clearing in this area, and we hope someday to turn the headstone over to photograph its epitaph. Elsewhere in the cemetery, close clearing revealed a few more concrete grave surrounds from burials in the 1920s and 1930s than we had previously seen. A few views of the “before” condition of the cemetery. Photos © 2017 Jay Osborn. Sashko blazes a path through the undergrowth. Photos © 2017 Jay Osborn. In addition to the new Jewish cemetery, two other sites in Rohatyn will be surveyed beginning next week. These are Holocaust-era Jewish mass grave sites located at the north and south ends of town. Following a series of meetings with the City of Rohatyn over the last nine months, responsibility for preparation and clearing of the new Jewish cemetery was assumed by Rohatyn Jewish Heritage, with the City of Rohatyn organizing and managing the preparation of the two large mass grave sites using local contractors and workers, with some of the costs of labor and equipment covered by Rohatyn Jewish Heritage. Clearing work at the north mass grave began last week, and at the south mass grave earlier this week. Detailed information about the upcoming survey can be found on our project page in both English and Ukrainian. Clearing progress is already visible at midday. Photos © 2017 Marla Raucher Osborn and Jay Osborn. We will return to Rohatyn on May 22 for a final review of preparations at the two mass grave sites, and to trouble-shoot any unexpected issues before the start of the survey a few days later. The new Jewish cemetery is regularly maintained by the City of Rohatyn with the involvement of local heritage activist Mykhailo Vorobets. The same is true for the old Jewish cemetery in town. A group photo at day’s end. Photo © 2017 Dasha Balabai. Rohatyn Jewish Heritage is grateful for the generosity of the Lviv Volunteer Center (a branch of Hesed Arieh involved in charitable, civic, and heritage projects in the Lviv Oblast) not only for providing manpower for this big job, but also for arranging transportation to and from Rohatyn and many of the tools and equipment. Special thanks to the LVC’s director Sasha Nazar and project coordinator Nykyta Symonovskiy, and to Vitaliy Nadashkevych of Law Craft LLC for coordinating with the City of Rohatyn the preparation of all three sites. We also continue to work closely with Rabbi Moyshe Kolesnyk of Ivano-Frankivsk, a longtime supporter of our work in Rohatyn and an indispensable resource on questions that concern Jewish religious practice and commemoration. We’ll end here with a huge thank-you to yesterday’s individual volunteers, who are undoubtedly stiff, sore, and scratched today like we are: Sasha, Dasha, Sashko, Tanya, Ivan, Nykyta, Roman, Yura, Bohdan, Danilo, Slava, and Casey. We hope to join you in your volunteer efforts at other places in western Ukraine this year and beyond. A panorama of the cemetery near the end of the day. Photo © 2017 Jay Osborn.